Foster Care Awareness Day Proclaimed in Poteau. 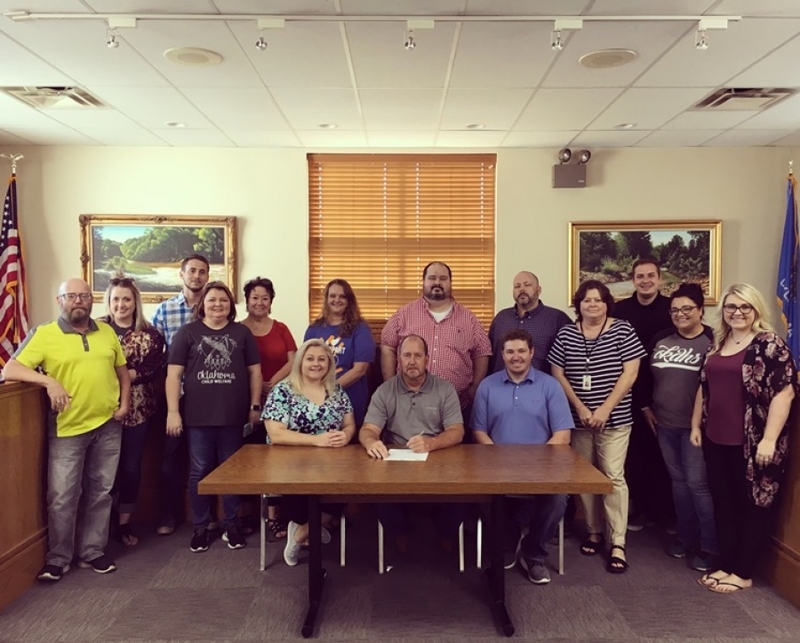 Poteau – Mayor Jeff Shockley poses with personnel from the Department of Human Services as he issues a proclamation for Thursday, October 4, 2018 as “Foster Care Awareness Day” in the City of Poteau. Foster Care Awareness Day is about raising awareness of the need of families to become foster and adoptive parents to serve Oklahoma’s children and families. There are currently 105 children in the state’s care in LeFlore County; upon which twenty-two children are currently placed out of county. By becoming a foster or adoptive parent, you will help to ensure every child receives a safe, loving home they deserve every day. To inquire about becoming a foster or adoptive parent, please contact 1-800-376-9729 or visit www.okfosters.org. For other ways to become involved in supporting children and families, contact Deanna Martin at 918-649-2367 or Aaron Goad 918-649-2467. You can report child abuse and neglect by calling 1-800-522-3511.